We pressed on into traditional dungeon crawl territory this week as the adventurers continued to explore the crumbling goblin ziggurat. They knew that their target was in here somewhere and that he hadn’t had time to set up much in the way of defences, so they trusted to barrelling through. They caught their breath, pulled people out of the pit, and continued up the staircase into another sacrificial room. 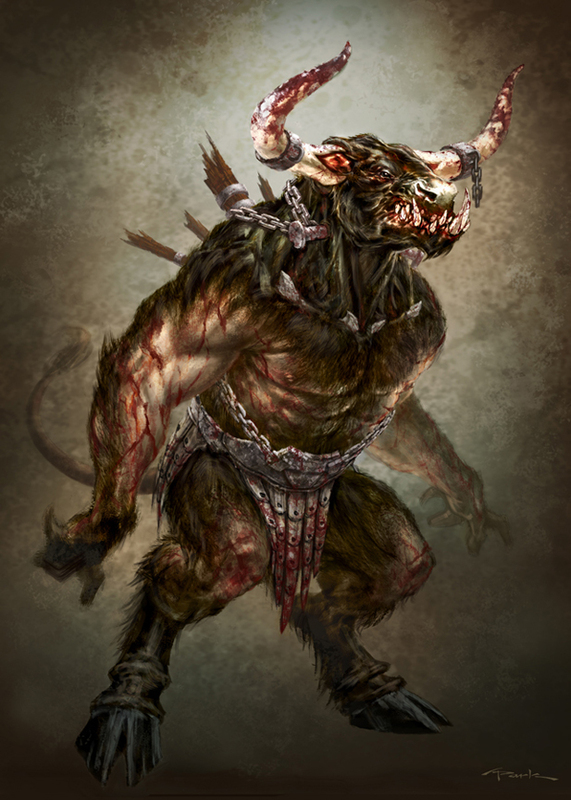 This one seemed to have a theme of animal sacrifice, judging by the murals on the walls, and the undead tasked with preparing sacrifices were still here – two minotaur zombies. Slow-moving but armed with enormous greataxes, they met Koff’s initial charge with ponderous axe blows that would have killed pretty much anyone else in the party. When his return blows did not kill them outright either, you could feel the sudden tension among the players. We’ve been playing these characters through from first level, the first time we’ve done this for a while, and so there’s starting to be a level of investment in them now they’ve reached fifth level that we’ve perhaps not experienced as a group in the last couple of years. Part of the legend that has begun to build up around Koff is essentially his ability to deal and take massive amounts of damage in combat. He’s been built as a very specialised character, with others taking more varied approaches. As a result, what usually happens when Koff hits something is that it falls down, often in small pieces. Having the party face what were essentially analogues of his character so soon after the ogre zombie ambush outside the ziggurat seemed to focus everyone’s attention rather nicely. It was a close fight, with everyone pitching in where they could, but hampered by the tight confines of the staircase and relatively small room. It’s the first time in a while that they’ve had to actively think about what order in the single-file staircases and corridors they’ve been having to take. Having cleared the room and quickly scooped up the ceremonial axes as trophies, they then had a choice of ascending further or taking a staircase down into the depths. With some judicious Religion checks, the consensus was that down led to the crypts and that this was most likely where Lucan had fled to as his coffin had been destroyed.